Create a Twitter account which is a micro-blogging tool where you can share your personal opinions, share news links, views in 280 character (previously the limit was 160 character). Twitter is best suited for a marketer and public figure because of its huge userbase being one of the most popular social media after Facebook. Free sign up for a Twitter account to connect with other similar minded people like you or any other public figure that inspires you. You can even talk with the people who are following you can create a fruitful relationship with your followers. The benefits of Twitter is, even more, when you see it with marketing perspective, you can use your Twitter account as your digital marketing platform, promote your blog and drive traffic to your business website and create your identity as a brand. 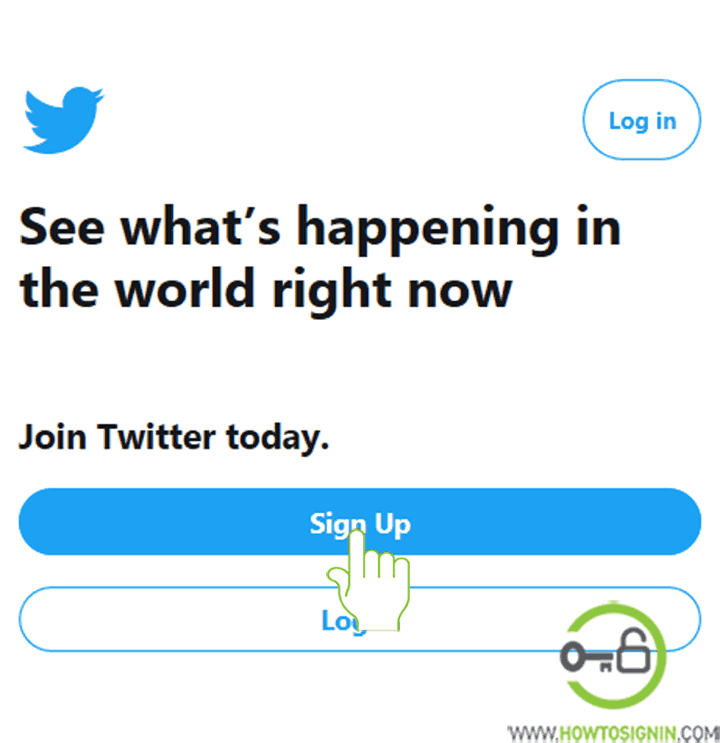 Visit Twitter.com and select ‘Sign up’ or directly go to sign up page. 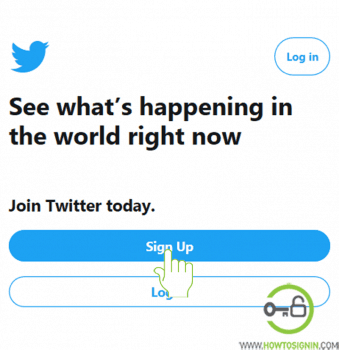 Twitter keeps changing its homepage design over a period, but the process you follow is same with different placement of sign up and Login button. Now start filling the information mention in the sign up box. Enter your Full name that will be your display name on your new Twitter account. Enter your phone number. It will be used to verify your account. 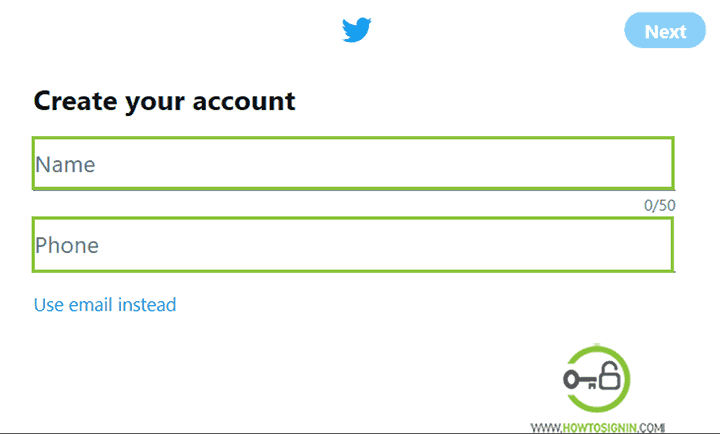 You can also create Twitter account without a phone number. To do so click on ‘Use email instead’ and hit Next. Now you will receive a verification code on your phone number or email address. 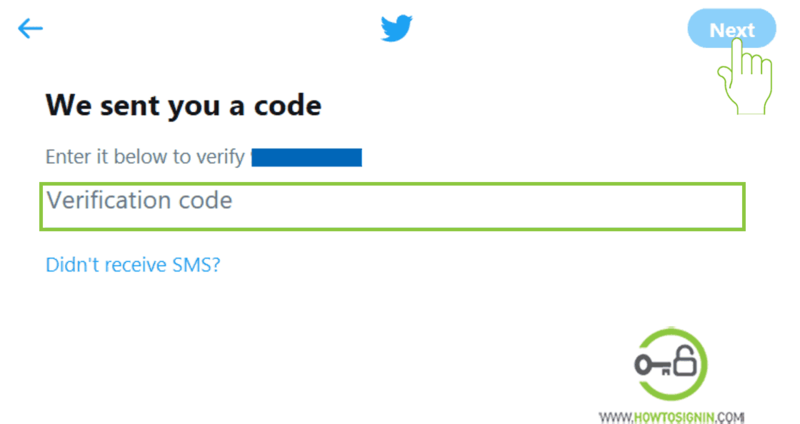 Check your inbox and check out for verification code received from Twitter. Enter the verification code and click Next. If you didn’t get a verification code, then try again by clicking Didn’t receive SMS or Didn’t receive email. 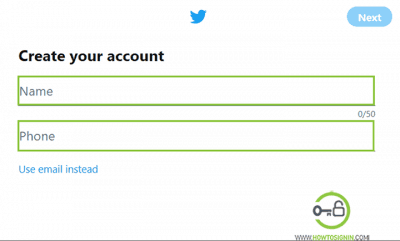 Create a new password for your Twitter account. Mix your password with unique characters, numbers and capital and small letters to make it strong and secured. 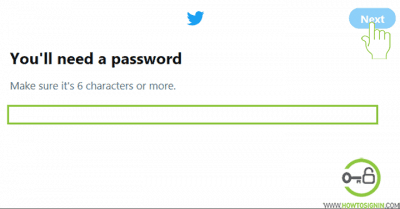 Your password should be at least six characters. After you make a password for your new Twitter account, in the next step you will be asked to add your field of interest. You will get profiles recommendation to follow based on the area of interest you choose. You can also skip this step if you don’t want to mention your interest. Finally, your new Twitter account is created. Now you can start posting new tweets, your opinions, views, news links and many more. You can add a profile picture and Twitter banner to create a good Twitter profile to attract more follower. You can make a new Twitter account via iPhone and Android phone. You either use Twitter app or browser of your phone to open a new account. Enter your Name and phone number. Or you can use an email account to register. In next step, tap on ‘Sign up’ and you’ll be prompted to make a new password for the account. You’ll get profile recommendations to follow. Follow if you like any of the suggestions. After creating a new account, the next step is to know how to get started with your new Twitter account. You must understand the basics of Twitter and its language. Here is the list of some major components of Twitter that are very important in Twitter handling. With 1/2 hours of time on the Twitter, you will be able to understand how to use Twitter. Tweet: This is the term used for a status update on Twitter, you can share your views, opinion, news links within 280 characters. Retweet (RT): Retweet means sharing the Tweet again by yourself or other Twitter user. @reply: When you add a comment on the tweet or send a public message to someone then you should use @username to mention the person you are willing to communicate publicly. Direct Message (DM): You can send a private message to the users following you. You use Direct Message to send and receive private messages on Twitter. Twitter Handle: Your Twitter Handle refers to your username. #Hashtag: Hashtag means adding Hash(#) sign before any important keyword in your Tweet update so that your Tweet update will be easier to find in the Twitter Search and can reach more volume of audience.